COURTESY PHOTO | Riverhead Foundation volunteers rescue a Risso’s dolphin that became trapped on a sand bar near Oak Beach. Volunteers from the Riverhead Foundation for Marine Research and Preservation added two new creatures to its hospital last week after they rescued a trapped dolphin and a 3-to-5-day-old harbor seal pup. The harbor seal pup was found struggling in the surf in Atlantic Beach, N.Y. last Saturday, it’s umbilical cord still attached. The nonprofit group is uncertain whether the pup, later named Penny, was abandoned by her mother or if the high volume of people on the beach kept her mother from returning to the pup. Penny is currently being cared for at the Riverhead Foundation’s Rescue Hospital, located at the Long Island Aquarium and Exhibition Center in Riverhead. She is fed a formula containing ground fish, vitamins and milk replacement formula five times per day, at a cost of about $300 a day. The 9 foot long, 600 pound Risso’s dolphin is swimming in the Riverhead Foundation’s Cetacean Rehabilitation Hospital. On Thursday, the second animal was rescued. The group was called to Oak Beach, N.Y., where a 9-foot-long, 600-pound adult female Risso’s dolphin was stuck on a sandbar. 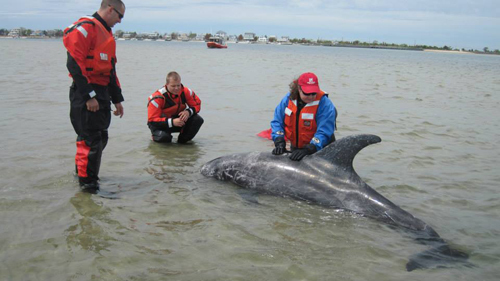 A volunteer rescue team was taken to the sandbar by a U.S. Coast Guard Fire Island vessel, and with their aid, successfully rescued the dolphin. She is currently receiving medical care at the our facility and will shortly be eating about 80 pounds of squid per day, which will amount to over $200 per day in food costs alone!